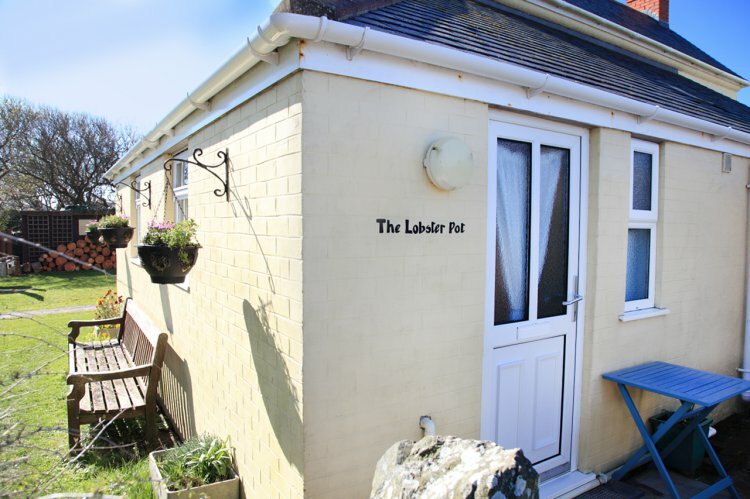 The Lobster Pot is in a quiet part of the village, yet less than 500m from the village centre and with the road to Church Cove just opposite the front door, you can join the coastal path here for miles of cliff top walking. In the village there's plenty of options for dining out, takeaway or refreshments. From the front gate there is a pretty, sheltered garden with a bench and table, perfect for catching the morning sunshine. Entered from the driveway into the kitchen area, with bathroom off, and then on into the open-plan living and bedroom space. The kitchen is equipped with a combination microwave, table top 2-ring hob, fridge with freezer compartment, a sink and storage. The living area has a two seat sofa with TV and DVD opposite and a small dining table and chairs. In the bed area there's a king-size bed, bed side tables and lamps and a double wardrobe. The tiled shower room has a shower cubicle, toilet, handbasin and heated towel rail. Rental includes bedlinen, towels, central heating, WiFi and electricity. One off-road parking space is offered. Regret no pets and no smoking. For your convenience the owners live on site with one other letting property, Brick Cottage.